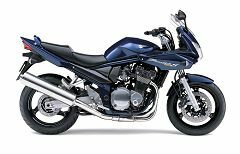 GSF1200S (Bandit 1200, faired) publicity photo from Suzuki. GSF1200/GSF1200S with 1157cc engine (manufactured 1996-on). All engines are DOHC inline four with 16 valves; 600, 650 and 1200 models employ SACS (Suzuki Advanced Cooling System) cooling that is combined air-cooled and oil-cooled. The 250 and 400cc models are water-cooled. The 'S' models come with a factory half-fairing, and starting from model year 2001, a dual-bulb headlight. The base model 'N' is an unfaired "naked" bike with a single headlight. The Bandit series has traditionally had a reputation as a hooligan bike, due to its budget price, muscle bike looks, and sheer torque (This mostly applies to the 1200 models). With more recent revisions, however, the bike has taken on a more streamlined and modern feel, taking it more towards sports tourer territory . Despite this, the 1200 remains popular with stunt riders, and is a bike of choice for various wheelie schools . The naked GSF600 N Bandit was released in February, available in red and green. It was based on the styling of the pre-existing GSF400 Bandit, with a retuned engine from the GSX600. The faired Bandit S model was introduced, where the bikini half-fairing had its debut. Available colours were red, green and teal green. Minor changes: A clutch switch (requiring the clutch to be pulled in when starting the motorcycle, for safety reasons) and carburettor heaters. Colours were red, green and black. The N model had passenger grab rails added. However, the S model had no changes. Both were available in blue, black and orange. Debut of a near rear shock absorber, providing rebound as well as preload adjustment. Colours were blue, back and red. Colours were blue, black and red. New rear bodywork, as well as fully electronic instrumentation was introduced. The S Bandit fairing changed to a more modern styling, with twin headlights. More major changes made this year. The first 1200 Bandit models were released in January 1996, featuring a retuned and enlarged version of the engine featured in the GSX-R1100. Other differences from the 600 cc models included a fuel gauge, higher specification suspension and larger diameter front brake discs. Also the 1200 Bandit featured a hydraulic clutch. Colors were maroon, green and black. No changes were made, and the colors available were maroon, black and blue. A version of the S Bandit with anti-lock braking was introduced for certain world markets. No changes. Colors were maroon, black, green and silver. No changes. Colors were maroon, black, green and additionally brown on the S model. No changes. Colors were maroon, blue, black and green/gold. Tokico brake calipers (six pistons at the front). 20 liter fuel tank (up from 19). Colors were blue, black, red and silver. Pages in category "Suzuki Bandit series"
This page was last edited on 23 May 2010, at 22:38.